Geographically Turkmenistan consists of three parts: deserts, oases and mountains. The country is situated in the south-western part of Central Asia and borders on Kazakhstan and Uzbekistan in the north and the east, and on Afghanistan and Iran in the south. In the west it is washed by the Caspian Sea. At the mention of Turkmenistan, the first thing to appear in our minds is desert. It is not surprising as desert covers eighty percent of the country's territory. In general opinion the desert is the limitless ocean of the sand, endless moving chains of sandy hills. However, in the Kara-Kum Desert moving dunes cover no more than one tenth of the surface and for the most part are consolidated by the bushes of black saxaul which accounts for the name "Kara-Kum" - "black sands". Travelers, for the first time visiting the Kara-Kum Desert, often wonder at dense bushes and thorny plants: is this a desert? But the sands are not waterless. Just the reverse, sandy deserts, though looking absolutely arid, keep big reserves of groundwater. Local people say, "Kum bar, su bar", which means, "where there's sand there's water". Upper water-bearing layer resting on the waterproof layer supplies desert plants with water. However the relief of the desert is formed by different elements. There are vast flat depressions that dry up to the extent of baked-clay surfaces cracked into hexahedral plates resembling parquetry on being looked at from afar. Only a limited number of algae and lichen varieties can survive on such surface called takyr. Another peculiar natural phenomenon is so called 'transit' rivers, which run across the desert and flow into the Amu Darya or Syr Darya. Plots of cultivated land and wild bushes, tugais, stretch along these rivers. Here subsists its own peculiar life: the world of hygrophilous plants, insects, snakes, song-birds. When in bushes of tugai, it is hard to imagine that these lively strips of nature are located in the desert. The construction of the Kara-Kum canal that runs from the upper reaches of the Amu Darya to the Caspian Sea became a remarkable event in the life of the country. This artificial 'river', the length of which is one and a half thousand kilometers, irrigates about a million hectares of the land, supplies with water towns, cities and villages in the southern parts of the countries, including Ashgabat, the capital of the country. River boats sail along the canal and even fishery has been successfully developed here. In the past, oases appeared at the spots where there was water and caravan routes passed. One may say that the Great Silk Road, which intersected the territory of Turkmenistan, ran from well to well, from oasis to oasis. Thus the trail from Merv on the Murgab river to Amul on the Amu Darya bank was hard to pass. A traveler had to cover hundreds of kilometers, to suffer heat, wind, sandstorms and possible encounters with robbers. But those who managed to overcome these hardships reached Amul - a big trade centre on the Amu Darya river crossing. Here the travelers could find long-awaited safety, relax and profitable commerce. In the later period there was built a railroad and a big bridge in this place and the town was renamed into Charjou. Recently the town has been given a new name - Turkmenabad. Mountains are the third constituent of the country's landscape. They stretch in the south, along the border with Iran, and their height is up to 3000 meters above sea level. 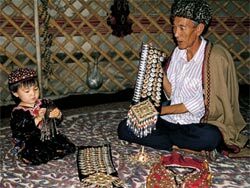 They are, of course, incomparable with the Tien-Shan or Pamir mountains, but local people, especially those living in the capital, love their 'domestic' mountains and eagerly spend time in shadowy gorges and green valleys. The most popular resort, close to Ashgabad, is Firyuza resort with its gardens, parks and the legendary multi-trunk plane tree named "Seven Brothers". History of Turkmenistan, located on the crossroads of caravan routes, was rather rich: now and then the country found itself in the vortex of events, often against its own will. Many times the country was conquered by different conquerors and became a part of alien empires. In the sixth century BC Turkmenistan was a part of the Persian kingdom of Achaemenids, in the fourth century BC Alexander the Great invaded the country. From the third century BC it was under the Parthian kingdom. The Arabs invaded the country in the eighth century AD, and five centuries later it was conquered by the Mongols. In the fourteenth century Turkmenistan became a part of Temur's kingdom; and, finally, in the nineteenth century, it joined the Russian Empire. After the revolution and civil war in 1921 Turkmen oblast, as a part of Turkestan ASSR, was formed, and in 1924 there was made up Turkmen Soviet Social Republic under the USSR. Turkmenistan proclaimed its independence on October 27, 1991. The ancient caravan road witnessed prosperity of such civilizations as Parthia, Merv, Khorezm. To the west from Ashgabad there rise the ruins of Nisa, the capital of the powerful Parthian kingdom. The remains of urban quarters, temples, palaces have survived to present day. During the excavation archaeologists found wonderful ivory vessels, clay and stone sculptures, coins, characters on the clay plates. These archeological finds are of universal importance. To the north of Bairam Ali town there lie the ruins of another ancient town - Merv, which is rightfully included in UNESCO's World Heritage List. 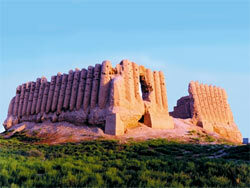 This is the most important historical and architectural monument of Turkmenistan. 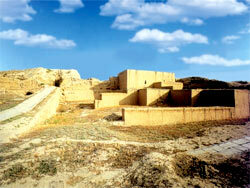 Merv's antique part, Erk Kala settlement, was populated in the first millennium BC. 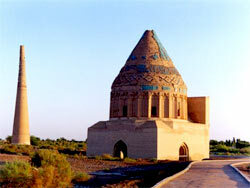 The town reached its peak in the 12th century under Seljukids and Khorezm Shakhs. The remains of Sultan-Kala settlement are the best remaining testimony to these powerful states. The Mausoleum of Sanjar and the grave of askhabs, Prophet Muhammad's associates, are rightfully called the gems of oriental architecture. In the north of Turkmenistan, in lower reach of the Amu-Darya River, near Kunya-Urgench, there lies in ruins ancient Urgench - the capital of Khorezm in the 10 - 12th centuries. Many historical monuments have preserved here. Among them mausoleums of il Arslan, Tyurebek Hanim and Fahreddin Rozi, grand sixty-meter minaret of Kutlug-Timur, the highest one in Central Asia. Over the grave of Tekesh shakh, founder of the powerful Khorezmian Empire, in the 12th century there was built a beautiful mausoleum with high tent-like dome. The relic mountain forests with their age-old trees, endemic subtropical plants and unusual water composition of numerous mineral springs impart a special attractiveness and originality to the nature of Turkmenistan. Thus, in the grove of jujube-tree in Kugitang nature reserve there are trees which are more than two centuries old. No less unique is pistachio savanna of Badhyz nature reserve. Among the trees growing on the territory of Turkmenistan there are many 'long-livers'. And the oldest is five-hundred-year-old Shahoz - Walnut King, which grows in the district of Karakal, in Ayder Gorge. Another wonder of Turkmenistan are Karluc caves in Kugitang. The length of one of them is more than five thousand meters. There are about thirty caves here, some of which are still waiting for their explorers. By the beauty of their interior Karluc caves have no match throughout Central Asia. A kind of "Jurassic Park" is the site on the slope of Kugitang Ridge, near Hojapilata village, where one can see petrified footprints of dinosaurs. Here, on the limestone surface of the Jurassic period, there have preserved about 500 footprints of ancient lizards that lived 140 million years ago. 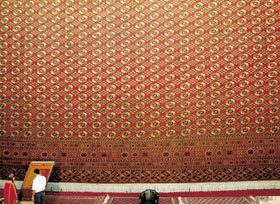 Today Turkmenistan is a secular independent state, which is rapidly developing. The Republic is a full member of the world community and keeps neutrality in foreign policy. Turkmenistan possesses large reserves of oil and gas which form the basis of country's well-being. Many oilfields are exploited; there function oil refineries and carbon producing factories. Fine-stapled cotton, highly valued in the world market, is the Republic's main cultivated crop. Turkmenistan takes a leading place in karakul sheep breeding. Another important branch of the country's agriculture is silkworm breeding. Turkmenistan, in a sense, can be called a sea power. Port Turkmenbashi, which, after the renovation, is to become the most up-to-date port on the Caspian Sea, works at its full capacity. The fleet of Turkmenistan is constantly increasing; the ships under the flag of Turkmenistan can be met in the ports of Mahachkala, Aktau, Astrahan, in Iranian ports of Enzeli and Bender-Torkemen. Hot dry climate of Turkmenistan, to which people from northern latitudes are not accustomed, is rather favorable for treatment of various diseases. There are several health resorts in the country, including the famous climatic resort Bairam-Ali for the people suffering renal diseases. The Turkmen have always been horsemen. The horse for them is a friend, member of the family. Old Turkmenian proverb says, "When you start your day, say hello to your father, then to your horse". 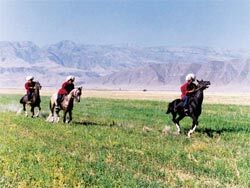 The Turkmen inherited from their ancestors, Parthians, not only love for horses, but also the famous Ahaltekin breed, which is known all over the world for its grace, speed and indefatigability. Ahaltekin breed is considered to be the national symbol of Turkmenistan. Central part of the State Emblem is decorated with the silhouette of a horse of the legendary breed. And a horse, as it is known, always races onward.